The Unlocking Detention (#Unlocking17) ‘virtual tour’ of the UK’s immigration detention facilities has been underway since mid-October and will conclude on 22nd December. It is taking place at a time of heightened interest in the way the UK detains people accused of offences against the immigration control system. The recent Panorama exposé of the conditions which detainees are subject to in one G4S-run detention centre – officially styled ‘Immigration Removal Centre’ caused triggered concern because of the evidence it showed of bullying and intimidation directed against detainees by some staff. But concerns about the way the system operate goes further than the instances of violence which are known to take place in detention centres. The immigration rights coalition supporting Unlocking Detention argue that the problem goes right to the very heart of an approach to managing immigration which can deprive people of their liberty for indefinite periods of time. The Unlocking Detention website explains that close to 30,000 migrants enter removal centres every year. Whilst most are held for periods of a few days or weeks a significant number are locked up for a year or longer. Detention powers place no limit in the time in which people can be held in these facilities. Immigration detention in these removal centres is not intended to deal with criminals who have been convicted before the courts. The power to deprive people of their liberty is invested in Home Office officials who can act at their own discretion whenever there is a suspicion that an individual is in breach of an immigration condition. Mistakes are often made and people are arrested and detained often whilst they still have valid applications for leave to remain with the Home Office, and even when they have been settled in the country for many years and are not subject to immigration control. The recent case of 61 year old Paulette Wilson, resident in the UK after arriving as a 10 year old in 1968, is an example of just how wrong the system can be. The Unlocking Detention virtual tour ‘visits’ one of the UK’s nine detention centres. It features blogs from people who have been detained at that facility, and some who still are. Volunteer visitors to the centre, NGOs and campaigners who are involved with challenging immigration detention, families, friends, neighbours and communities over whom detention casts its long shadows are all given their chance to set out their experiences of being locked up in an immigration removal centre. 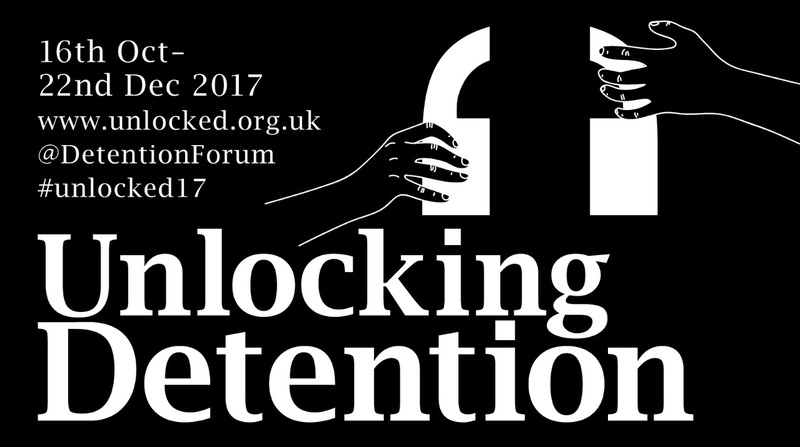 Visit the Unlocking Detention website to sign up as a participant on the tour and receive its daily tweets and blogs. You can add your personal support to the growing movement to change the detention system by posting a ‘selfie’ showing why you are backing the campaign. For anyone around in London on Thursday 16th November there is an All-Parliamentary Party Group meeting on Refugees meeting on immigration detention, taking place from 10:30 -11:30 in the Grimond Room in Portcullis House, Westminster. The invitation of open to all and even if you can’t come yourself the campaign is asking that you email your MP to tell her/him about it and ask that they come along to show support for the campaign to reform immigration detention. More details about the meeting are available on this webpage.